Trattato. Dell’inventione et arte liberale del gioco di scacchi... Diuiso in Discorsi, Sbaratti, e Partiti. quarto (200 × 135 mm), (98) ff. signed a4 A–Z4 Aa2 (gathering O misbound) and paginated (8) 1–186 (2). Large woodcut insignia on title-page (arms of the dedicatee), woodcut of a chess board on folio D1 verso, numerous woodcut initials, and other ornaments. Margins browned and stained, other minor defects, but still a good copy. 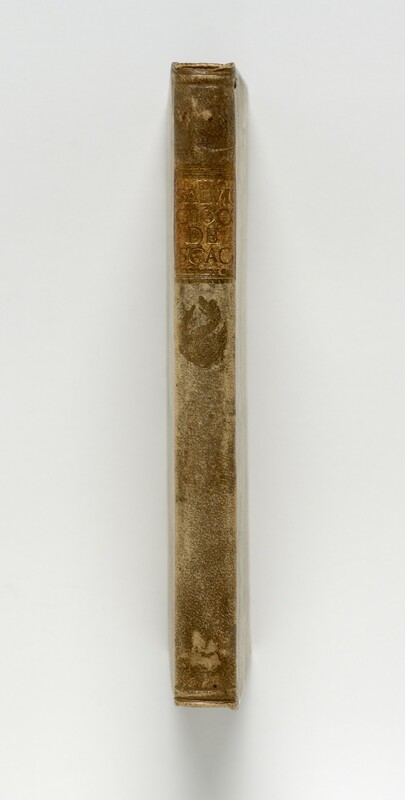 binding contemporary vellum over boards, heraldic gilt stamp on spine (see above); edges stained green. 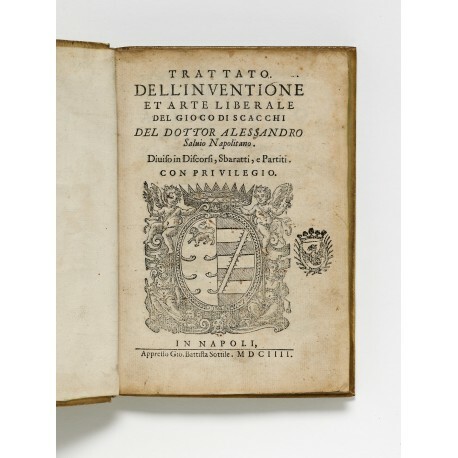 This first edition of Salvio’s treatise is dedicated to Fulvio di Costanzo, marchese di Corleto, and comprises thirty-one chapters with openings, eleven with games at odds, and twenty-one giochi di partiti, or problems, some being supplied from actual play. In his analysis Salvio follows the Neapolitan rule that the King forfeits his right to castle after receiving a check, which often made play to give or avoid an early check advisable that would otherwise appear without purpose. Some Neapoli­tan players, he tells us in Chapter xl, would prefer to lose a piece than the right to castle. Local rules prevailing elsewhere are carefully noted. Salvio’s Trattato marks the end of the first creative period in the history of the modern game. 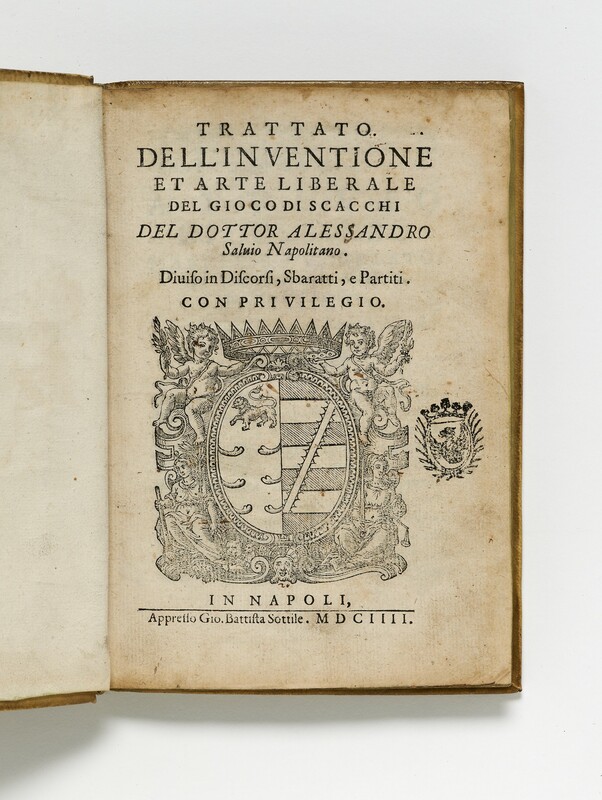 ‘Italian players were generally content to rely on Salvio for their openings, and made no attempt to advance the theory of play until the rise of the Modenese masters in 1750’.3 New editions of the work were published at Naples in 1612, 1618, 1634, and 1723. The author had learned his play from Michele di Mauro and was one of the leading Neapolitan players from 1595 onwards, earning a European reputation when he defeated the reigning master Paolo Boi, called ‘Il Siracusano’ (1528–1598), in a match at Naples in 1598. Salvio was at the centre of chess activity in Naples and by 1634 was master of a ‘chess academy’ established there in the house of Alessandro Rovito. 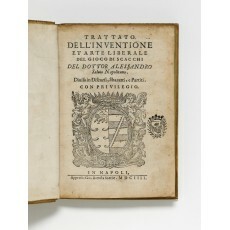 Besides this Trattato, he wrote La Scacciade, a chess tragedy reportedly printed at Naples in 1612 and 1618, and a biography of Giovanni Leonardo, called ‘Il Puttino’, the leading Italian player in the period 1560–1590, annexed to the 1634 reprint of the Trattato. 1. ‘Al Malandrino che ridà gli dià, Purchè vada a farse à ren­dere al mastro, et al uno et al altro gli dia come di sopra. Amen. F[rancesco] S[ora]’. 2. Harold J.R. Murray, A History of Chess (Oxford 1913), pp.817, 820–823; Michel Wittock, ‘Giacomo Boncompagni: heurs et malheurs d’une bibliothèque’ in Mélanges d’histoire de la reliure offerts à Georges Colin, edited by Claude Sorgeloos (Brussels 1998), pp.103–118. 3. Harold J.R. Murray, Short History of Chess (Oxford 1963), p.56.